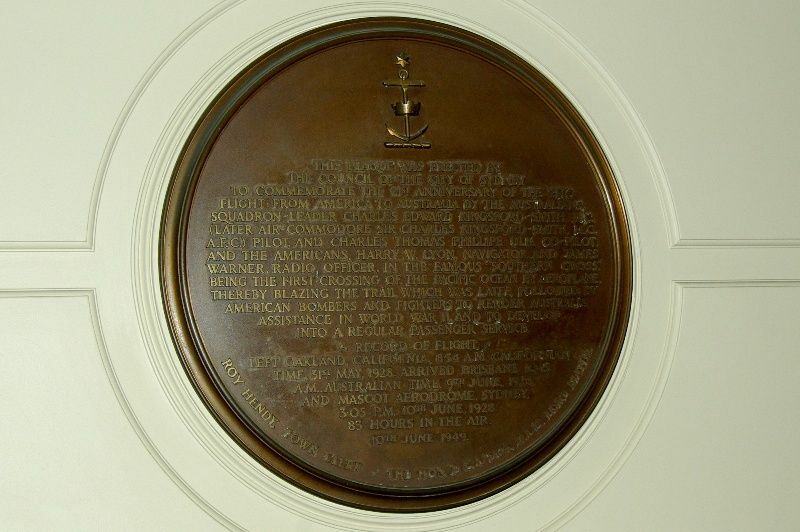 The plaque commemorates the 21st Anniversary of the first flight over the Pacific Ocean by aeroplane by Charles Kingsford Smith and his crew in 1928. The flight route was later followed by American bombers in World War Two rendering assistance to Australia and later developed into a regular passenger service. Twenty-one years ago yesterday, Kingsford Smith landed at Mascot, in his blue Fokker "Southern Cross" on the last leg of his epic flight over the Pacific from Oakland California. He was accompanied by C. T. P. Ulm and two Americans, Lieut. Lyon and James Warner. The Southern Cross made the trip in 83 hours 29 minutes flying time over eight days, seven hours and 14 minutes. B.C.P.A. planes, flying what is known as the Southern Cross route now take 29 hours flying time. The Canberra Times (ACT), 11 June 1949. THIS PLAQUE WAS ERECTED BY THE COUNCIL OF THE CITY OF SYDNEY TO COMMEMORATE THE 21st ANNIVERSARY OF THE EPIC FLIGHT FROM AMERICA TO AUSTRALIA BY THE AUSTRALIAN SQUADRON~ LEADER CHARLES EDWARD KINGSFORD~SMITH M.C. ( LATER AIR~COMMODORE SIR CHARLES KINGSFORD~SMITH M.C., A.F.C.) PILOT, AND CHARLES THOMAS PHILLIPE ULM CO~PILOT, AND THE AMERICAN, HARRY W.LYON, NAVIGATOR AND JAMES WARNER, RADIO OFFICER, IN THE FAMOUS "SOUTHERN CROSS." BEING THE FIRST CROSSING OF THE PACIFIC OCEAN BY AEROPLANE, THEREBY BLAZING THE TRAIL WHICH WAS LATER FOLLOWED BY AMERICAN BOMBERS AND FIGHTERS TO RENDER AUSTRALIA ASSISTANCE IN WORLD WAR 11, AND TO DEVELOP INTO A REGULAR PASSENGER SERVICE. LEFT OAKLAND, CALIFORNIA, 8·54 A.M. CALIFORNIAN TIME , 31ST MAY 1928. ARRIVED BRISBANE 10·15 A.M., AUSTRALIAN TIME 9TH JUNE 1928 AND MASCOT AERODROME SYDNEY 3·05 P.M.10TH JUNE 1928. 83 HOURS IN THE AIR.